Sheep produce large amounts of lanolin that helps protect their skin and “coats” by providing waterproofing” and wear resistant properties. 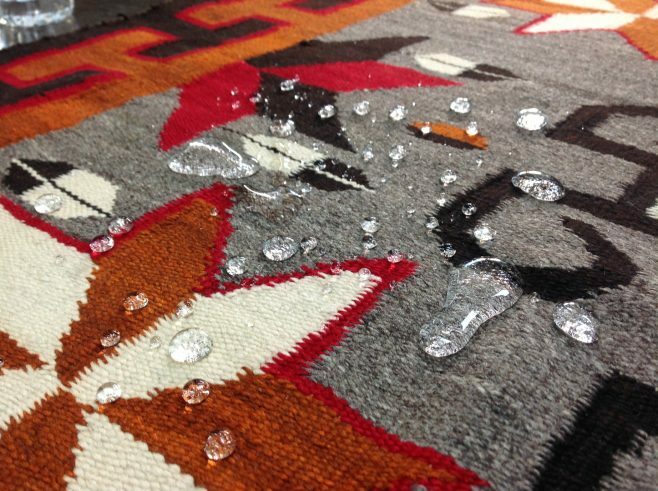 When their wool is sheared to create beautiful area rugs, coats, and other consumables, the natural protection is no longer produced, and the wool is subject to staining and fiber deterioration. To preserve wools natural stain fighting properties a fiber protector can be applied. Clients often ask about fiber protector and how it works. To preserve the fibers from staining by most spills. Protector is designed to form a shield around the fibers thereby allowing most spills to be easily removed by a paper towel. People with allergies will benefit as pollen and other contaminants are easily removed with a thorough vacuuming. Wool protector is invisible and does not leave a residue that will change the feel of the fibers. Wool guard protector is environmentally friendly and safe for pets and infants. For more information about fiber protector for Oriental, Turkish, Persian, wool and silk area rugs, please visit a video we have had prepared by clicking on this link. Oriental Rug Salon is a Certified Partner with the prestigious Institute of Inspection, Cleaning and Restoration Certification (IICRC). In addition, we are A+ rated by the Better Business Bureau and a five-year-in-a-row-winner of the coveted Angie’s List Super Service Award. For more information about Oriental Rug Salon, please visit us at www.OrientalRugSalon.com or call us anytime at 239-424-8171 – Lee and Collier County or 941-893-1655 – Punta Gorda, Port Charlotte, and Sarasota Florida.